Every year, pencils in my pencil case manage to poke holes in my pencil cases from the inside. But this year, I decided to put an end to this evildoing. Pencils will never poke holes in this pencil case! It is lined with leftover fabric from patio chairs. But you can still always keep it simple and just have a super strong pencil case. What really makes this pencil case is a sturdy lining. I used leftover outdoor patio chair material (it is made to be weatherproof and support the weight of a person). Other materials that would work would be a strong canvas, duck cloth, etc. (see some utility fabrics here.) Look for the strongest, most resonably priced fabric you can find. I would recommend searching in the scrap or clearance section, because not much material is needed. For the outer material, I used fabric from the sleeve of an old sweatshirt, and for the details such as Jake's face, I used felt. I used a nine-inch non-separating zipper. Needle, thread, pins, scissors, and a sewing machine if one is available to you. I hand sewed this because my machine was broken, and there was no problem. Depending on the character you are making (if any), you may or may not need stuffing. I stuffed the head of my character. If you are making a character, you may want to hot glue the facial features on. You may also sew them on, but I decided that the stitches would take away from the cartoon-like quality of Jake's eyes, nose, and jowls. Because my outer material was made from a sweatshirt sleeve, cutting may be different for you. If you are using store bought fabric, simply cut a nine inch by nine inch square. If you are cutting from a sweatshirt sleeve, cut off the ribbed cuff of the sleeve, and measure nine inches down the sleeve. Cut the sleeve to have a nine inch piece of fabric. Cut off the seam and open it up, and create a nine inch by nine inch square of fabric. My sleeves were stained with pencil graphite, so I used tons of stain remover and hand scrubbed the stains out. To cut the lining, simply place your outer fabric onto the lining fabric and cut around it. Layer the outer and inner layers right sides in, with the zipper between them. make sure the zipper front is facing the outer fabric's right side. Pin the fabrics and the zipper together in the right order and sew parallel to the zipper. Because the width of the case is 9 inches, the circumference of the sides will be nine inches also. I found a roll of tape that had a circumference of 9 inches, and traced it onto the lining fabric to cut out two circles. Then I carefully pinned and sewed one circle onto the side of the case, making sure that the weave on the side matched the inside of the case. To sew the rest of the zipper, pin the zipper to the lining. Make sure the zipper is aligned with the side sewn on. The first picture was taken before I trimmed the excess material (trim it so the edge is even with the zipper). Now, fold the outer layer so its right sides face each other. Pin the edge to make a sandwich with the lining, zipper, and outer layer as in the second picture. Sew parallel to the zipper once more. Once you sew the zipper on, flip the outer layer around the lining so it looks like the third picture. The third picture is a view of the inside of the pencil case after this step. Cut out two circles from the outer fabric the same way you cut out the circles for the lining. 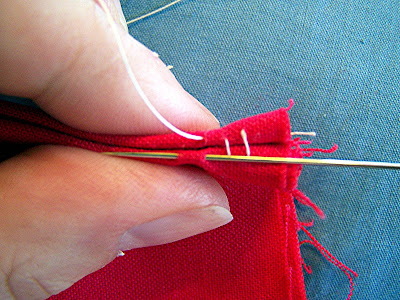 Sew the sides on using the invisible stitch. But if you want to take this project further and turn your pencil case into a character, read on. Cut out the pieces for decoration. For Jake, I cut out two oval shaped pieces for his head, and sewed them together and stuffed it like a pillow. Jake's ears were just 'J' shaped lines of stitches. Then, I cut out Jake's eyes and jowls. Jake's eyes were just two black felt circles, then two smaller white felt circles. The jowls were an upside down bubble letter 'u'. I then hot glued on Jake's eyes, jowls, and nose onto the head. I also cut out pieces for the legs and tail. After finishing the head, I sewed it onto the side of the pencil case. Then I got excited that it was a 'Jakerpillar'. But I still wanted to add the legs and tail. Enjoy your new super strong pencil case! Finn is kind of tube shaped too, he'd make a good pencil case. Haha. Cool 'ible. I had the same problem but then I picked up a semi-rigid plastic pencil case at Office Depot (I think). Sewing is so not my thing, unfortunately. good idei! getting a pencil case then just making the head, hehe. hot glue is okay too. but this was my idea. aww! can you make a video for it though?!?!? I WOULD SO LOVE IT! Who doesn't love jake? I'm making an extended Jake scarf! Slamacow! Ooooh. This is neat. I may make one of these for my friend's birthday, actually.